Our ham and baconis produced right here in Tasmania by us at our Cambridge premises, We support our farmers by only using Australian grown pork in the all the products that we make. After careful preparation from our butchers, our ham is cured and naturally smoked using either Tasmanian eucalypt or European Beech wood chips. Whether you prefer the traditional cooked on the bone or the fully boneless leg hams & schinken, you and your customers will appreciate the difference that our slow cooking process makes to the flavour. 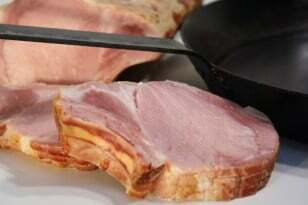 We are pleased to announce that we are now producing some free- range ham and bacon products using Otway pork. This superb tasting pork is produced in Victoria and totally grown without the use of sow stalls and farrowing crates. to read about Otway Pork click on the logo: They are the first Australian pork producer to gain RSPCA accreditation.